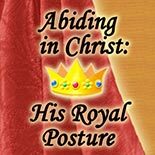 Real abiding in Him is a connected sense of who I am that affects my posture and how I carry myself. It is a royal posture. If we get out of step with the Spirit, it is like wet, stinky clothes to us which we have an innate distaste for.